A sliding glass door’s large expanse of glass transmits a lot heat out of the home in the winter and into the home in summer. This heat flow takes three forms: heat conducts directly through the glass in winter, solar heat transmits through the glass in summer, and air that leaks around the edges of the door. Heat travels rapidly through glass when there is a large temperature difference between indoors and outdoors. In winter, the cold glass surface pulls heat directly out of objects in the room, including your body if you’re nearby. Cold glass also creates drafts by cooling nearby indoor air that then circulates around your home. Insulating quilted shades, though fairly expensive, can improve winter comfort and energy efficiency. The best of these products have vertical tracks that seal the edges of the shade. Another option is to fasten an insulating shade fabric to the frame or glass with velcro. The shade fabric with either of these options is available in either light-transmitting or opaque (room-darkening). For blocking glare and solar heat, exterior sun-blocking solutions are best. These include exterior reflective rolling shades and exterior solar screens. Interior shades and curtains are less effective because the solar heat has entered the home before it reaches the interior barrier. There are storm window packages for sliding glass doors, but this option is both expensive and rare. Air leakage is a common cause of comfort complaints and an energy problem too. This air leakage happens around the perimeter of the door panel. Older sliding glass doors often have operating problems, too, that are caused by dirt in the tracks and worn rollers that contribute to air leakage by keeping the door from shutting properly. You can replace worn and leaking weatherstrip, and worn and broken rollers to improve door operation. Search for the phrase: “sliding glass door parts”. However, unless you’re good at identifying the correct parts on the internet and you can repair the door yourself, the DIY repair may not be successful. Handymen or glazing shops in your area may or may not work on sliding glass doors. One door with fixed glass on each side is better for comfort and energy efficiency than a sliding glass door. 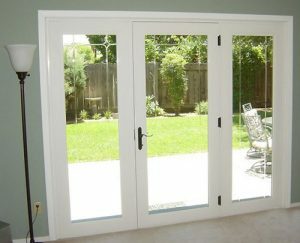 If you choose to replace your older sliding glass door, consider a hinged patio-door unit (French door). Hinged doors leak a lot less air than sliding doors. The best hinged-door option is a single swinging door and one or two large insulated-glass panels next to it. That design avoids two swinging doors that seal to each other in the middle, which can leak air as it ages. Unless you live in paradise, you’ll appreciate the minimal air leakage that a single door gives you. The type of insulating glass is a particularly important choice for these large doors because there are two varieties of insulating glass: one for cooler climates with a high solar transmittance and one for hotter climates with a low solar transmittance. If you air condition and the door is currently a summer solar heat problem, order the lowest solar transmittance you can find. The technical term for solar transmittance is Solar Heat Gain Coefficient (SHGC). The lowest SHGC currently available is 0.30, which only admits 30% of the solar heat falling on the glass. For more information on windows, see The Homeowners Handbook to Energy Efficiency and Your Home Cooling Energy Guide. So how much improvement is there in these areas if the home owner opts for a atruium/patio door type of french door where one side is typically locked into place and the other side is the opening side?